This creamy dip is one of my favorite ways to use eggplant. If you haven't made Baba Ghanoush, you are missing out and are in for a treat! 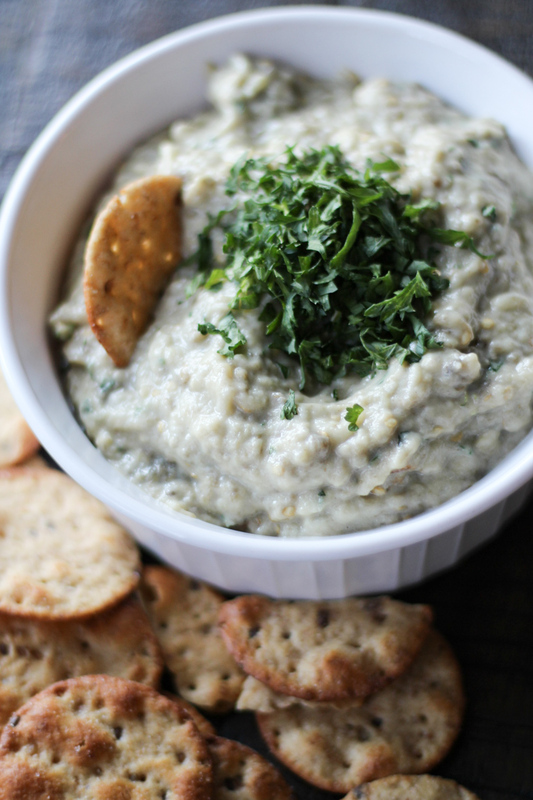 This eggplant dip is creamy, low-fat and has a nice lemon zip. I love it served warm with raw vegetables or crackers, but it's also fabulous spread on a sandwich! Prick the surface of each eggplant several times with the tines of a fork. Under the broiler, blacken/char the eggplant for 25 minutes. The skin should be completely shriveled and dark, and the eggplant almost fall-apart tender. You will need to rotate the eggplant a few times during this process, so it evenly cooks. Set them aside to cool slightly. Mash eggplant with a fork. A few chunks are fine; you want a relatively smooth texture. Stir in all other ingredients, tasting before adjusting seasonings. It is crucial that you don't UNDER salt. The salt will make all the flavors pop once you have enough, so slowly add more until you have a bright flavored dip! Serve with pita triangles, baguette slices, chips, crusty French bread…or dive in with a spoon.